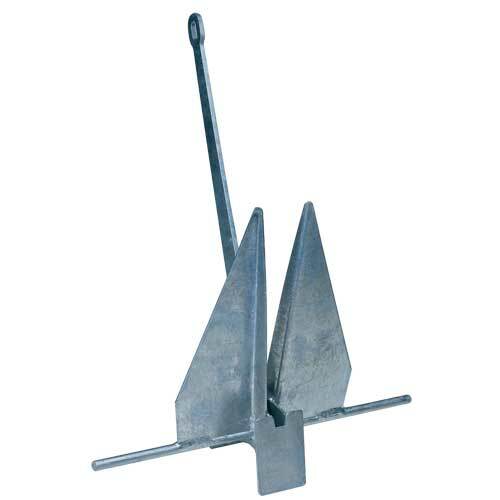 High-quality, affordable anchors feature precise dimensions and hot-dip galvanizing for corrosion protection. Patterned after the original lightweight Danforth anchors, including precision die-cut components for accurate assembly and symmetry, a tapered shank with chamfered edges for deeper seabed penetration and increased stock length and fluke angle for roll stability and dependability. Pros: An accurately made, traditional lightweight anchor. Precise crown tooling and tapered shank allow deep anchor penetration. Controlled shank/fluke angle for reliable sets. Great in sand and good in mud. Cons: Limited or no holding in grassy, rock or clay bottoms. Doesn't readily reset on breakout. Hinge prone to jamming.